A convoy of MINUSMA vehicles drives through the streets of Menaka in northern Mali. 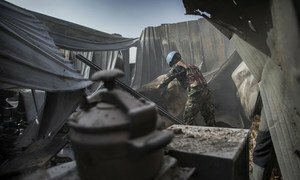 Four United Nations peacekeepers and a member of the Malian armed forces were killed and 21 others were wounded on Friday in what Secretary-General António Guterres called “outrageous” attacks against the UN mission in the country. Mr. Guterres joined his Special Representative for Mali, Mahamat Saleh Annadif, and the Security Council in strongly condemning the attacks against the UN Multidimensional Integrated Stabilization Mission in Mali (MINUSMA) in the Ménaka and Mopti regions. “The Secretary-General conveys his deepest condolences to the Governments of Burkina Faso, Mali and Niger and his profound sympathies to the families of the victims. He wishes a swift recovery to the injured,” his spokesperson said in a statement. The Council reiterated that “any acts of terrorism are criminal and unjustifiable, regardless of their motivation, wherever, whenever and by whomsoever committed,” reaffirming the need for all States to combat, by all means, threats to international peace and security caused by terrorist acts. It further stressed the importance of MINUSMA having the necessary capacities, including combat convoy companies, to fulfil its mandate and promote the safety and security of the UN peacekeepers. The “very serious challenge” facing peacekeepers with the United Nations Stabilization Mission in Mali (MINUSMA) makes it vital that additional efforts are made for the four-year-old operation to fulfil its mandate, the UN peacekeeping chief has said.